← St Helen’s Parade – looking back. This image is one of several of North Kensington to be found on the Britain from Above website (see link below). It shows the Sutton Trust Estate from the north looking south towards Dalgarno Gardens and Highlever Road. 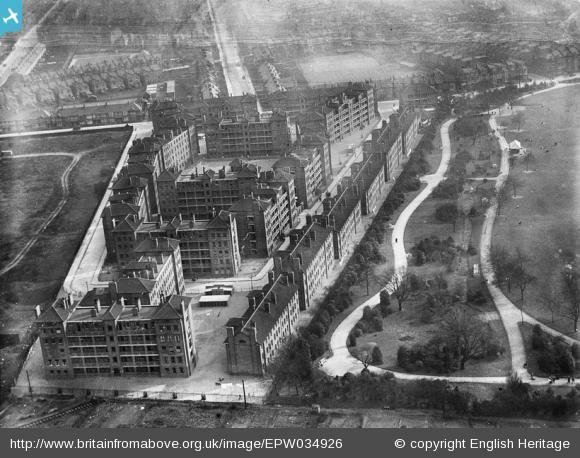 In 1931, the neighbouring Peabody Estate – to the left in this photo – had not yet been built. To the right you can make out Little Wormwood Scrubs with rather attractive landscaping and possibly the stream featured in old postcards running down between the paths. At the bottom of the photo there are allotments and there is a short stretch of railway track leading to the edge of the estate from the bottom left hand corner. Perhaps this was built to bring in the bricks and building materials necessary to build this large estate directly from the railway line to the north? There are other fascinating photos of London on this website. Photos can be downloaded for free use and if you register (free) then you can use the magnification tools on the website to look in detail. This entry was posted in St Quintin Park, Uncategorized and tagged Dalgarno Gardens, Highlever Road, Little Wormwood Scrubs, Sutton Estate. Bookmark the permalink.